Ahhh. 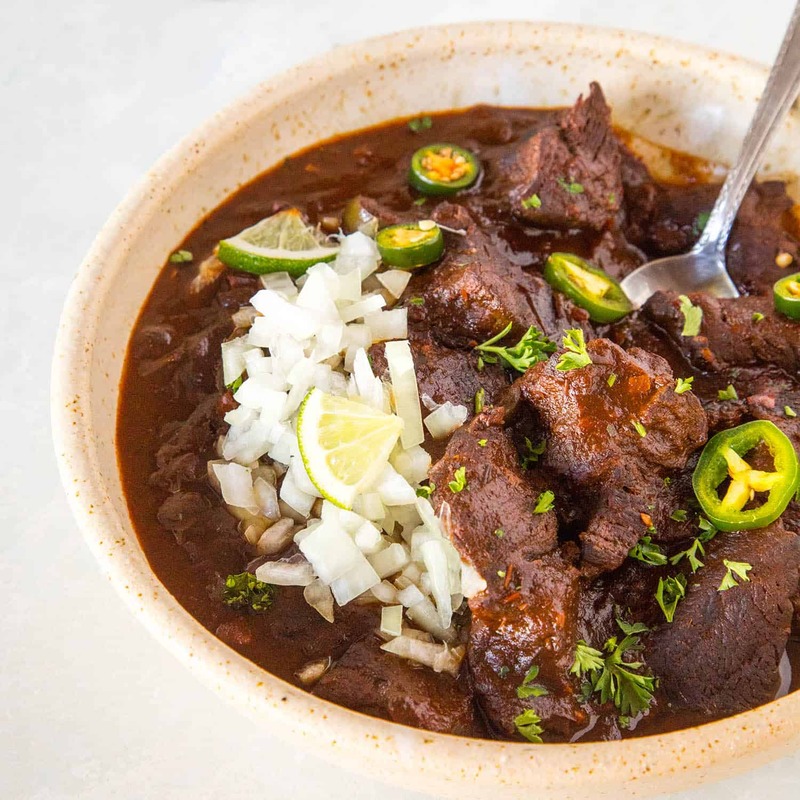 Chili. How do I love thee? 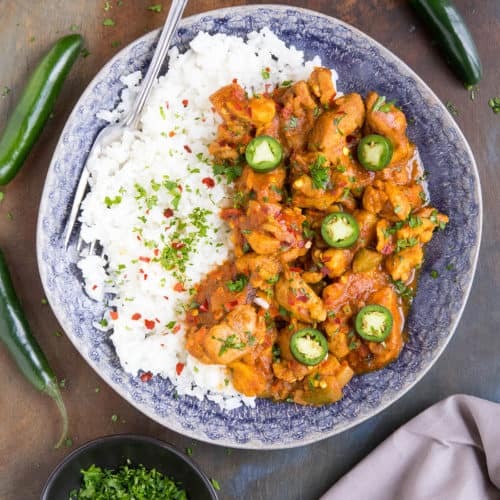 When the weather turns colder, my mind quickly turns to thoughts of food in pots – we’re talking thick, hearty soups, simmering spicy stews, and OF COURSE, loaded pots of chili cooking low and slow on the stove or in the slow cooker. 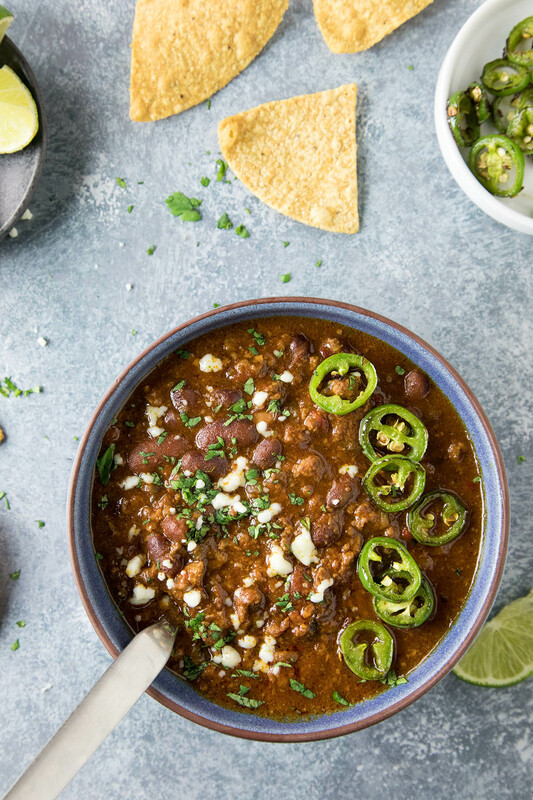 Seriously, give me some chili and I’m happy to lounge around all day in the house in my comfy clothes and good book while the cold weather rages outside. Like this particular chili. 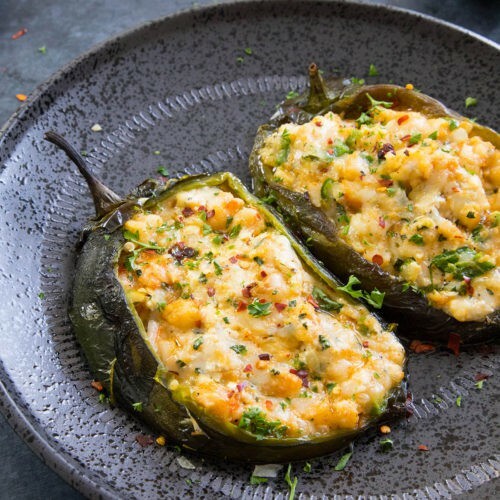 This recipe includes roasted poblano peppers for a rich, earthy flavor. Poblanos are exactly that, rich and earthy, particularly when they are roasted. Their skins char and puff up, making them easy to peel off, leaving the thick pepper flesh with a smoky flavor you can’t get anywhere else. Roasting poblano peppers is rather easy. 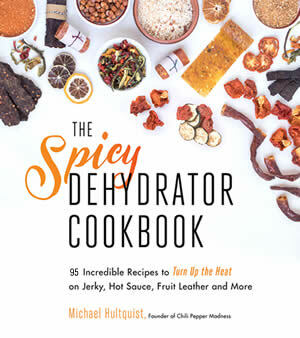 If you have questions about roasting, see our page – How to Roast Chili Peppers. For this recipe, I used the broiler method. 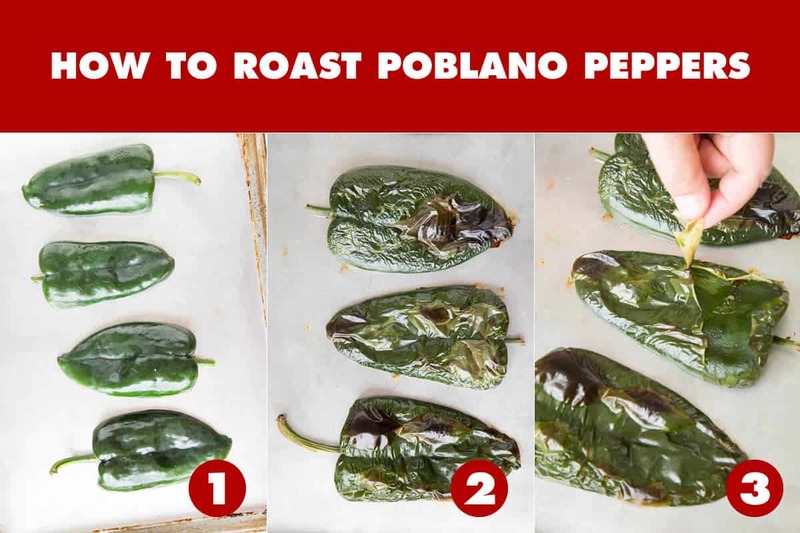 Basically, slice the poblano peppers in half lengthwise and set them on a baking sheet. Broil them in the center of the oven about 20 minutes, or until the skins char and puff up. Remove, cool slightly, and peel and discard the skins. Simple enough, right? Chop them up and toss them into a slow cooker. The only other cooking is cooking the ground beef up in a pan along with your sweet onion. Into the pot that goes, along with fire roasted tomatoes, tomato sauce, kidney beans, and plenty of seasonings. 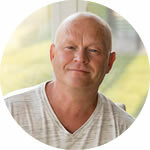 Try my Homemade Spicy Chili Powder Blend for this recipe. Then! WAIT. Ugh. The waiting part is rough, especially when you work from home and you can smell the pot cooking down there, filling the house with those wonderful aromas. Yes, I use beans in my chili. Feel free to omit them. I am NOT a purist when it comes to chili. If it tastes good, it tastes good! And yeah, this one sure does. Bring in all the fixin’s you prefer. 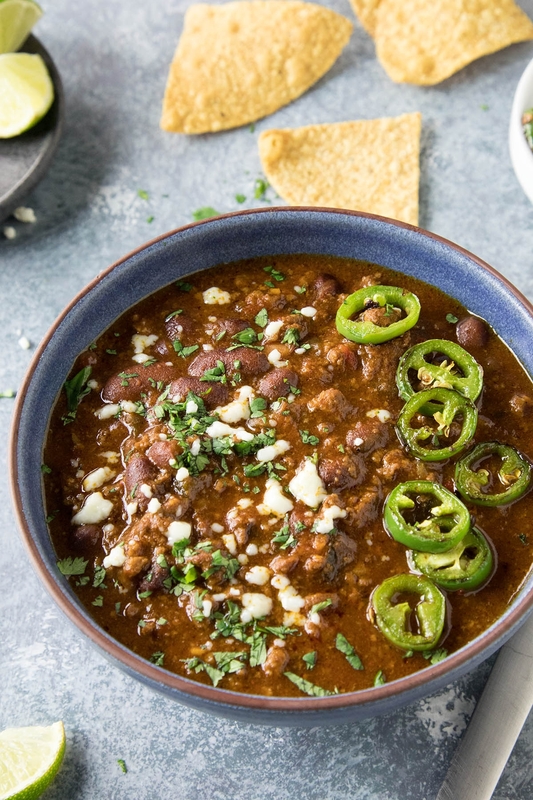 I always love a bit of melted cheese on my chili, fresh chopped herbs for a pop of flavor, and particularly, for me, pan roasted jalapeno peppers because we all know about my particular #JalapenoObsession. Truly, I can’t help myself. I also enjoy serving a bowl with tortilla chips for a bit of crunch factor. AND! Do not forget the hot sauce. 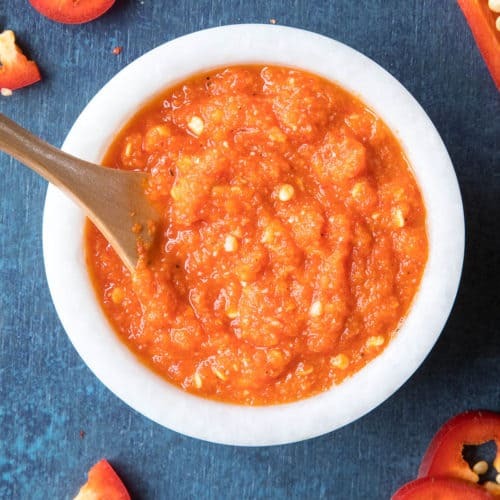 Hot sauce is a must. For me, anyway. Can’t get enough. That’s it, my friends. Low and slow! 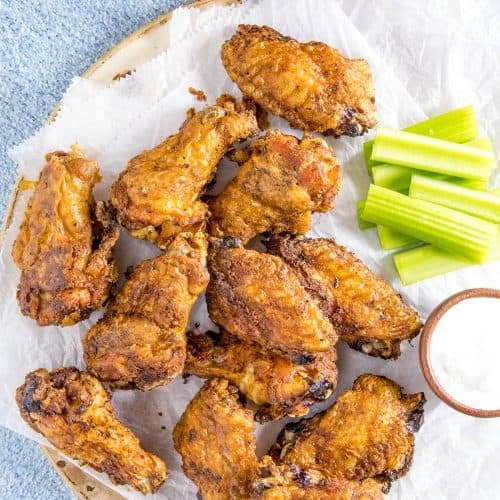 Let me know how this recipe turns out for you. I hope you like it! Sendpics! Share it on social media, if you will! I would GREATLY appreciate it. 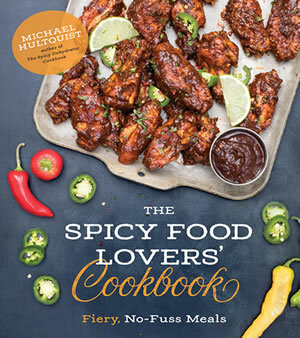 And please, look out for my new cookbook! 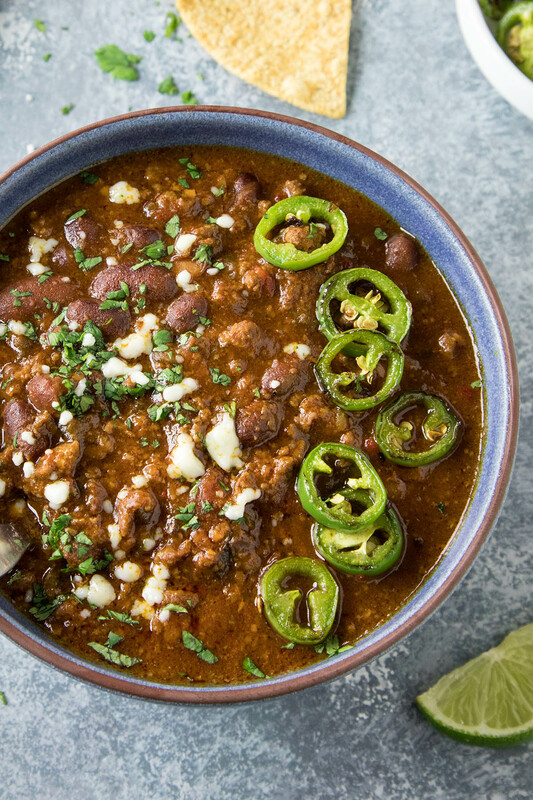 This slow cooker chili recipe is easy to make and filled with flavors of America's southwest, including roasted poblanos, ground beef, fire roasted tomatoes, and plenty of seasonings. Perfect for gameday. 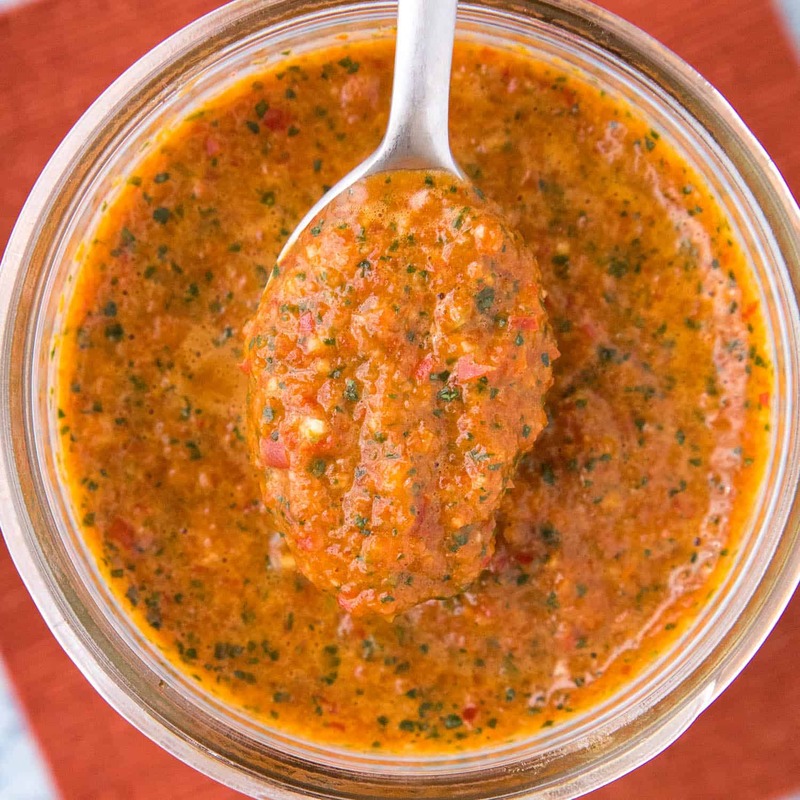 FOR SERVING: Fresh chopped herbs shredded cheese or queso fresco, corn chips, pan seared jalapeno peppers, hot sauce, etc. Heat the oil in a large pan and add the ground beef and chopped onion. Cook them down about 10 minutes, or until the beef it cooked through. Add them to your slow cooker. While beef is cooking, set your oven to broil. Slice the poblano peppers in half lengthwise and set them on a baking sheet. Broil them in the center of the oven about 20 minutes, or until the skins char and puff up. Remove, cool slightly, and peel and discard the skins. Chop the poblanos and add them to the pot. Add all of the remaining ingredients and stir them up. Cook them on low for 6 hours, stirring every now and then. Adjust for seasonings if you wish. Serve in bowls with your favorite fixin’s. I used tortilla chips, queso fresco, fresh herbs and pan seared jalapeno slices. 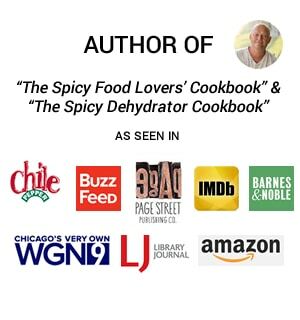 I’d been looking for another classic chili recipe, and boy is this it! Just reading the ingredient list made my mouth water and I was not at all disappointed by the end result when I made it. I did add some sliced serranos and 3 homegrown Carolina reapers for some kick and it turned out fantastic. Thanks for a fantastic recipe! 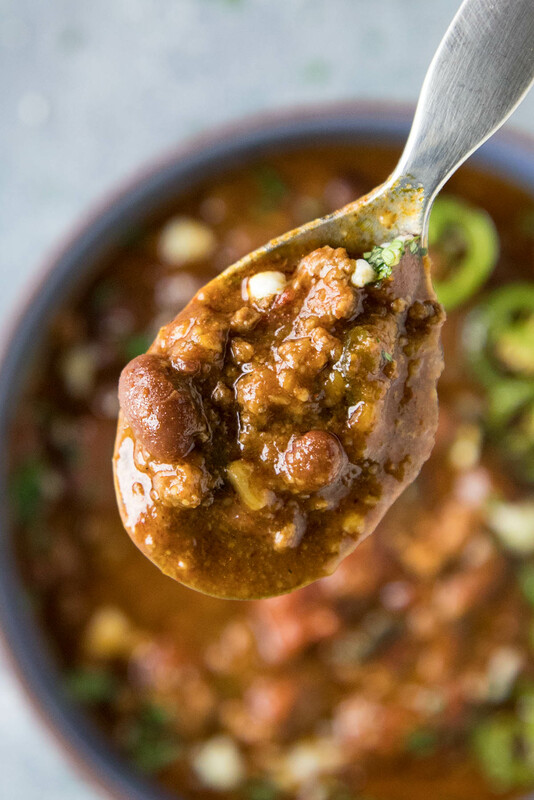 Anyone who loves chili HAS to try it. Awesome, Rick! Super happy you enjoyed it. I love the addition of the serranos, and yeah, those Reapers will definitely give some kick! Nice.